Graphene, a strong carbon material, is just one atom wide and conducts electricity better than copper. It was produced at the University of Manchester in 2004, winning its discoverers a Nobel Prize in 2010. "One of the limiting factors in utilising graphene is the high price compared to other materials," said Dr Zhao Jun Han from Australia's Commonwealth Scientific and Industrial Research Organisation (CSIRO). "If we reduce the price, we can promote its application." The new method involves heating soybean oil in ambient air until it breaks down into "carbon building units that are essential for the synthesis of graphene", the CSIRO said. Dr Han said the process is simpler and safer than existing methods, which use explosive compressed gases and vacuum processing. The new method could make it "significantly" cheaper, he said. Dr Han said the discovery, detailed in the journal Nature Communications, was made "kind of by accident". "In our lab we have very strict safety rules," he told the BBC. "We were trying to figure out if there was a safer way of making this material without using dangerous or explosive gases." 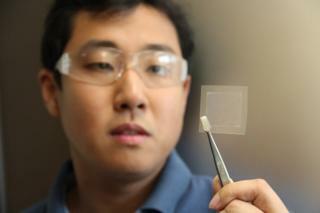 Dr Han said his team hoped to use the material in water filters, solar panels and batteries. The CSIRO-led study also involved researchers from The University of Sydney, University of Technology Sydney and The Queensland University of Technology. Is graphene really a wonder-material?